Today I have something slightly different to share. I have been an early morning Seminary teacher since September, and am absolutely loving it. After seeing Mad Gabs used in a Seminary activity last year (Book of Mormon), I decided I'd like to include a Mad Gab game in my lessons. 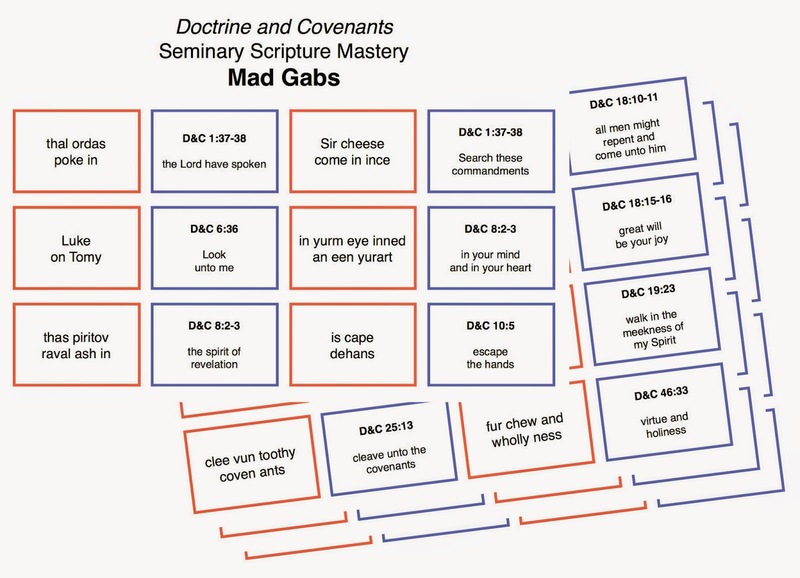 After searching for and not finding a full set of Mad Gabs for the Doctrine and Covenants online, I started working on my own set, and have finally finished a complete set for this year's D&C Scripture Masteries. So here are my D&C SM Mad Gabs, free for you to download and use. I hope you and your students enjoy them! The cards are in a 4 page A4 pdf document that you can download by clicking here, or on on of the the images. You can make a set of cards by gluing the MAD GAB and it's answer back to back for each card. You can make a set of cards with only the MAD GABS on them (blank on the back), which the students can then handle without seeing the answer, then print out the whole set onto one or two pages for you (the teacher) to use as an answer sheet. Well done. Thank you for making these available. I plan to use them in my class tomorrow. Thank you Tyson, you are welcome. I hope your students enjoy them! I am a first time seminary teacher and some days are a bit over-whelming. We are heaading into a week long break and wanted a game to play tomorrow. Thanks for the wonderful idea!!! Where are you teaching? We are about to have our half-term break too! So glad for the break. I feel like all I do sometimes is prepare seminary lessons (I am a first time seminary teacher too). I am really excited to use these with my class. We have had a hard year emotionally and I think these will add the right amount of fun as well as learning. Thank You!! How fun! Thank you, Elaine. BTW, my name is Elaine, as well. Don't meet too many of us. Woo-hoo! I found these nearly too late in the year, but better late than never! Thank you so much. Super fun! We're doing this for mutual tonight! Thank you!